Hurricane Harvey has left an indelible mark on our city and each one of us individually. But as the old saying goes: Every rain cloud has a silver lining. For us, that silver lining has been the overwhelming outpouring of support, incredible stories of resilience, and a sense of community that has caught the attention of our nation. Below are our own tales of heroism, compassion and strength – our silver lining stories. 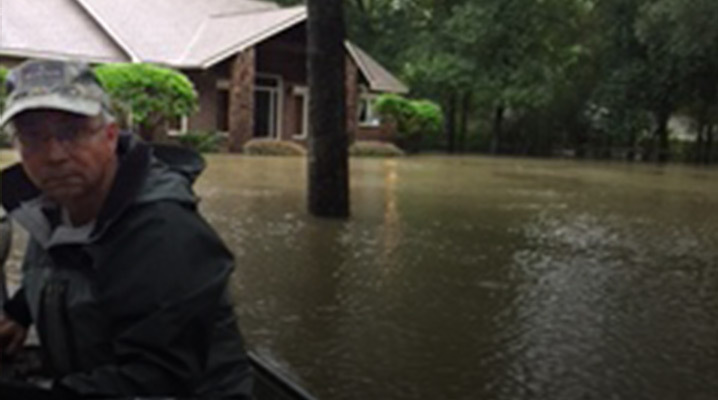 When Allen Shelton and his wife Christine’s home flooded during Hurricane Harvey, JLL employees began reaching out almost immediately to provide all the help they could. Carmen Morales and her husband went to the Shelton’s home Labor Day weekend to assist with clean-up and several others provided aide in various other ways. “Between JLL and church, people have just really reached out to us. We’re good, we’re covered,” said Allen. From the overflow of support the Shelton’s received, they were able to send volunteers to their neighbors as well. 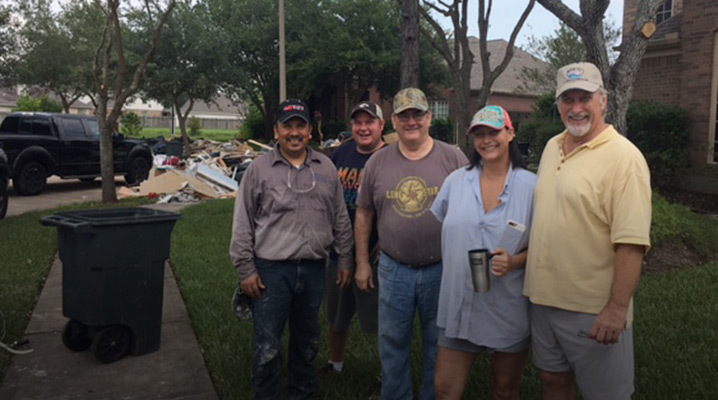 Carmen Morales, Laura Woodall and Jean Rivard played a special role in helping Allen and his wife recover in the aftermath of Hurricane Harvey. In the chaos and destruction of the storm, the couple’s two dogs, Tucker and Chloe, went missing. Carmen, Laura and Jean stepped in to assist with an exhaustive search for the dogs. The team checked every shelter in Houston and Austin regularly for weeks. Jean walked the Montgomery County shelter and graciously took the time to post information about the dogs on the “missing” pages of several websites. Carmen hung missing dog flyers around the New Caney area. The flyers would ultimately be how Tucker, a 2-year-old Corgi, was reconnected with his owners. A woman who had been rescuing animals in the area recognized Tucker on the flyer as one of the dogs she had rescued from the side of a busy street, where he had been walking wet and exhausted. Carmen posted updated flyers after Tucker was found and the group continued looking for Chloe through the end of September. Sadly, the Shelton’s would eventually learn Chloe, a 16-year-old Staffordshire Terrier, did not survive the storm. Despite the sad news, Allen expressed immense gratitude to JLL and colleagues who helped them search for their pets. Nina Daniels and her two kids evacuated their flooded home Monday, August 28th. Like so many in Houston, they have been working to put things back together ever since. 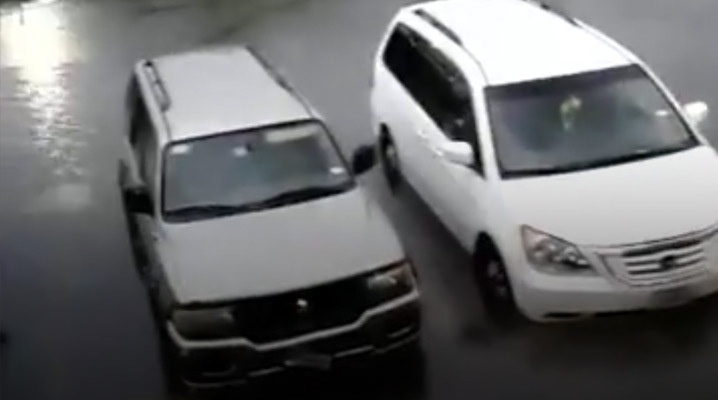 With help from a neighbor, Nina’s family was able to get from their home, near Highway 59 South and Beltway 8, to the parking garage where she had previously parked her car. They then drove to her mother’s house in southeast Houston. Nina would eventually have 18 inches of water in her home. She says she’s been overwhelmed with how colleagues have reached out and helped. Peyton Collins, Mary Stanton, Louise Keller, Mechelle Zumbado, Tammy Diezi, Shahid Javed and Kelly Giron have been some of the people helping Nina’s family. Coworkers have provided gift cards to meet immediate needs and prepared meals for her family. Nina says many are still regularly reaching out to make sure they have what they need to get back to normal. 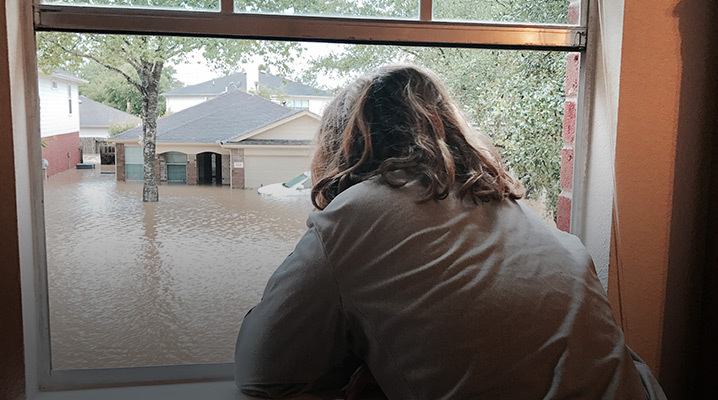 “It was a lake outside,” said Cara Kelley, describing what she and her husband, Marshall, saw outside their Katy home on the morning of August 29th. Cara and Marshall, who were married this past June, ended up with about three feet of water in their home as a result of the releases at Addicks Reservoir. The couple fled to Marshall’s parents who live nearby, but eventually ended up at Cara’s parents after her in-laws house was also at risk of flooding. Sometime after they evacuated, the roof in the living room of their home collapsed. With their home open and vulnerable, Cara and her husband went back to the property to salvage a few of their most precious belongings. JLL employees stepped in with a seemingly minor donation that ultimately allowed the couple to save a few of their things. She and her family had tried to buy boxes but found that most stores were either out or gouging prices. Cara says that shortly after expressing their need for boxes she received a call from Louis Lucko and others, who were able to provide a full suite of packing materials. 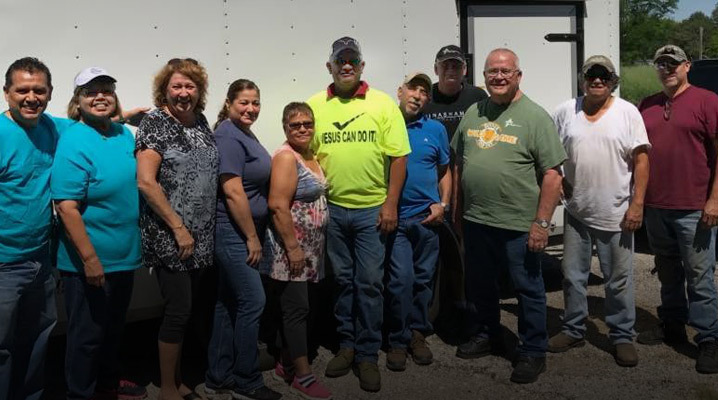 Once the boxes were provided and their belongings removed from the home, Valerie Chavez stepped in to help Cara and Marshall find a self-storage facility. Cara says the outpouring of calls and texts has meant a lot to them and that Stephen Borrego, the volunteer team leader assigned to her, has kept in touch to find out if they needed anything else. Described by the National Weather Service as being “unlike anything ever experienced” Hurricane Harvey left many making decisions they never thought they’d have to make. Jake and his girlfriend were eventually able to evacuate by boat Monday, August 28th thanks to a group of good Samaritans who had driven in from Crockett, Texas. He and his girlfriend were able to make it to his parents and have since been staying with family. The couple moved quickly on the demolition process and gutted their home in Spring on Wednesday, August 30th. 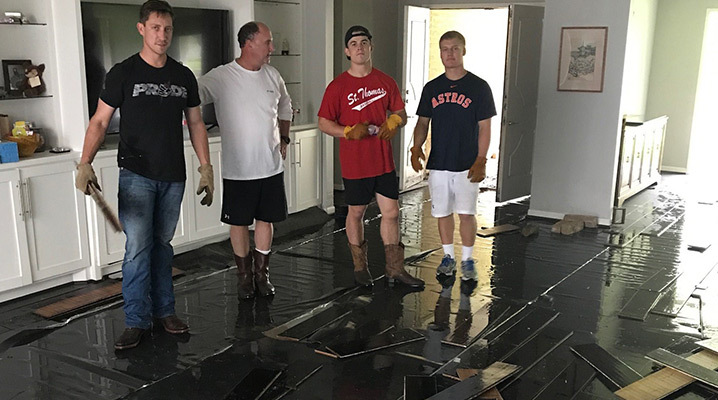 Tom and Mike Melody, Tom Fish, James Brolan and John Ream of our Capital Markets Finance team have been hard at work since August 29th helping flooded teammates, Jonathan Paine and Jimmy Board, in the aftermath of Hurricane Harvey. 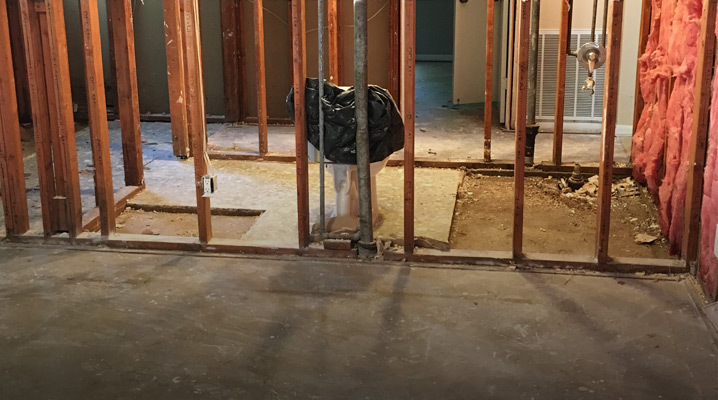 Mike, Tom, James and John have been busy at Jonathan’s house in Meyerland removing salvageable belongings, pulling up flooring and removing drywall. The effort has been a family affair as Mike and James’ teenage sons, who’ve grown up together, have helped with the labor, and Tom Fish’s wife, Sherrie, has helped by doing laundry for the Paine’s. Over at Eldridge and Memorial, the team has also been assisting Jimmy, and his wife and three young children, who had about 4 1/2 feet of water in their home as a result of the dam releases at Addicks reservoir. Jimmy says his team has helped remove belongings from his home, wash loads of laundry and have called to make sure we’re aware of all the resources JLL has set up for everyone affected. “It’s just the team helping the team,” James said. Many members of the Capital Markets Finance team have worked together for several years. The group stayed organized and in close contact over the last week via group text. John has been hard at work cleaning out his own home and helping his neighbors do the same. He and his wife had about 31 inches of water in his garage and about 6 inches of water in his home, but he still considers himself fortunate. Many of his Cypress neighbors have been devastated by flooding with up to 6 feet of water in their homes. John and his wife evacuated with their pets the evening of August 27th. He also assisted in evacuating his neighbor who had no means of getting out of her inundated home. John was able to rescue her with his boat and helped her connect with family in Tomball. Since returning to his home August 28th, John says he has been overwhelmed with the outpouring of calls, emails and volunteers. On some days he has had more than 40 volunteers from his community and church. “I had so many volunteers Thursday, I sent six people over to the neighbor to help,” he said. Colleagues and entire JLL offices across the country have reached out to ask how they can assist. In Houston, Mark Raines volunteered and Devin Rogers and his family jumped in to help. Grace Kennemer was, in John’s words, a “lifesaver” providing a meal “fit for kings” to the 25 volunteers working at the Roberts’ house and throughout the neighborhood. Stefanie Jordan and Craig Young also helped with demolition and clean up at the Roberts’ home over Labor Day weekend. “It’s very tragic, but it does so much to show the side of humanity that we don’t show enough, and that’s just the warm hearts people have to serve each other,” said John. Many JLL employees jumped into relief efforts before the rain even stopped. Lisa Reyerse was among them. On August 29th, Lisa and a friend collected items to donate and took them to the George R. Brown Convention Center, where they also spent the day volunteering. Lisa was assigned to sort and distribute clothing to evacuees. “Hearing the requests coming from those staying at the shelter, it became obvious that these people left their homes with nothing more than the clothes on their backs,” she said. Despite the obvious cause for their temporary situation, Lisa says she never talked with people about what happened. Instead she focused on having normal conversations with those willing to chat and even had the chance to joke around and laugh with a few of the clients. Lisa described the experience as humbling and said she received nothing but warm, smiling faces and thankful responses from the clients. Later in the week, Lisa volunteered at the Houston Food Bank sorting food for distribution to those in need. “That’s why I can smile,” said Chrysti Schwarz, as she reflected on the support she’s received from friends, colleagues and JLL in the aftermath of Hurricane Harvey. Chrysti and her son, Carsten, evacuated their home last week, which flooded due to the nearby Barker Reservoir and Buffalo Bayou. Chrysti was rescued by a group of good Samaritans from the Bryan-College Station area who were performing water rescues in her neighborhood. Her son, Carsten, was air lifted from their home and brought to a safe location where his godparents got him. The two stayed with Carsten’s godparents for the rest of the week. Taught to be self-sufficient and independent, Chrysti found it a bit difficult at first to accept the help she was being offered, but describes the support she’s received as “incredible”. Chrysti said colleagues have helped in many different ways. Louise Keller delivered gift cards for some immediate needs. Ed Prejean and Brian Jacobson helped by looking for temporary places for Chrysti and her son to live. Gery Jarrell delivered various supplies and offered to let Chrysti borrow her car. Michelle Lopez helped by shopping for Carsten’s school supplies. Lesa French brought Chrysti bags of clothes to replace some of what was lost. And as with every silver lining story, countless others have been involved in lending a hand, helping out and checking in. Brian Alling’s wife, Sherry, urgently woke him at 6 a.m. the morning of August 28th. 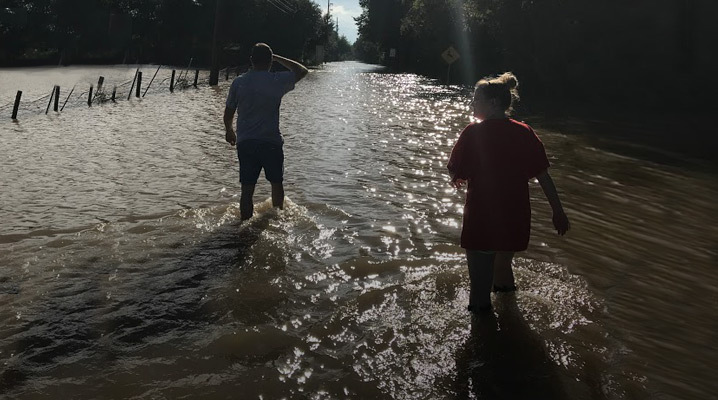 The police were driving up and down the streets of their Conroe neighborhood with a blow horn telling people to evacuate because the San Jacinto River was expected to cause devastating flooding. The couple scrambled to move belongings upstairs, pack a few items and leave as water seeped into their neighbors’ houses on either side. He and his wife drove to a family member’s house near Dallas and at 1 p.m. they received a picture from a neighbor. Their house had 37 inches of water in it. Brian returned on August 30th and was met by family and friends from church to begin work on the house right away. He says the outpouring from colleagues and even people he had never met at JLL has meant so much. “To have someone say ‘you don’t have to worry, we’re going to be there whatever you need’ – I can’t put it to words, it meant so much,” said Brian. Many employees have stepped in to help Brian and Sherry find their footing and meet some of their immediate needs. Carmen Morales delivered gift cards, while another employee spent an entire day looking for a hotel at which Brian and his wife could stay. The couple eventually got a call saying there was a room for them at the Woodlands Resort, the first three nights of which would be free and the rest of the week would be provided at an employee discount because they were with JLL. Others have helped keep business going, which has alleviated a great deal of stress. Phil Durbin and Will Whitehead have stepped in and taken care of client needs in Brian’s absence. Brian and his wife will be at The Woodlands resort through the end of this week and then plan to move into the second floor of their home, or a family friend’s RV if need be. In the wake of everything, Brian said he and his wife would just want the entire organization to know how thankful they are for the support. 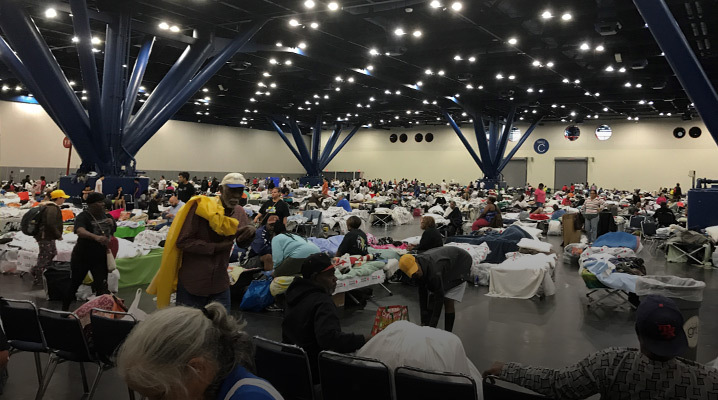 The need for help during and in the aftermath of Hurricane Harvey has been so enormous that many of the storm’s victims are also those lending aid to others. Roger Singleton and his wife were among those who took the opportunity to help neighbors and friends even with water rising in their own house. On the night of Sunday, August 29th, Roger and his wife went next door to get their neighbors, who they’ve known for about 15 years. Like many in the Friendswood area, the Singleton’s had about two feet of water in their house. 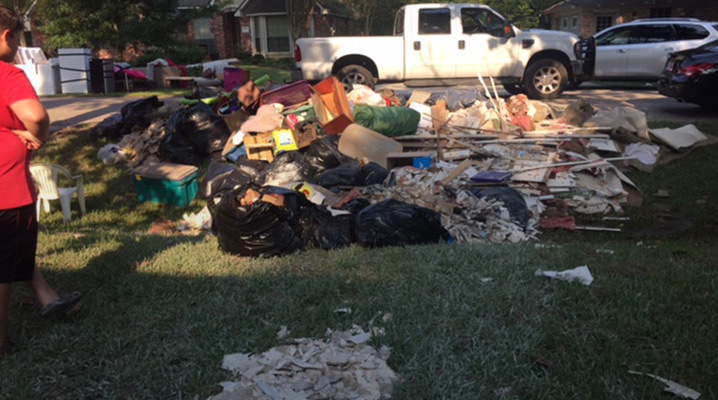 The water receded in Roger’s neighborhood August 30th and he and his wife got to work cleaning up both his house and helping his elderly neighbors do the same. Later in the week, church members came to help Roger’s neighbors finish the demo and clean up, but as of September 1st, Roger and his wife still had their neighbors living with them.